Seating charts are widely used for a variety of purposes - conferences, board meetings, weddings, receptions, and many more events. Creating a chart is an easy task, which allows you to visually arrange the seating, without having to worry if there will be enough room. With diagramming software, such as MyDraw for Windows and Mac, you can re-create a room in an aspect ratio which allows you to print the plan on a piece of paper. What do you need to create a seating chart? Knowledge of the number of people the seating chart will be for. In order to create a seating chart, you need to first create the basic plan of the room (or space) where the chairs will be located. This is where diagramming software comes in very handy, as it allows you to draw proportionally and thus avoid possible errors. When you create a proportional drawing of the room/space, you will be able to know exactly how many tables/desks you can fit in even if you've never been there before. After you have created the floorplan of the room/space where your guests will be seated, you should add the important details. Those include, but are not limited to the location of the door, the windows, any plants, none-movable furniture in the room, the stage, etc. All those are important details which will help you be absolutely accurate when adding the seating places. If there will be a stage, for example, you will need to arrange the tables so each of your guests can actually see the host/performance. 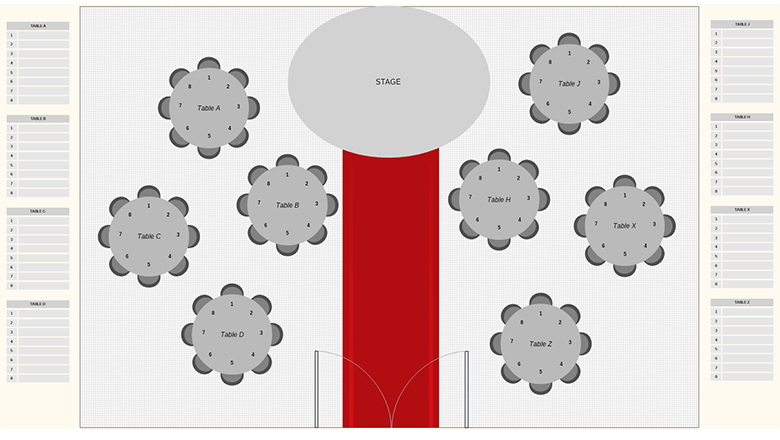 Once all important details of the hall/location have been cleared, you can go ahead and add the tables / desks on which your guests will be seated. Ideally, you'll know the size of the tables which will allow you to add the seating places proportionally to the floor plan of the room. The same applies for the chairs. Knowing the sizes of the chairs allows you to do an actual fitting and ensure that your plan will be executed as is on the day of the event. When the seating is arranged and you've matched the number of visitors/guests expected to the number of seats, you can add some final details. If you're creating a wedding seating chart, for example, you can add the names of the guests. With diagramming software such as MyDraw, naming the seats is extremely easy and only takes a few minutes. You can do the same for a board meeting or a conference, or you can add information about the items which should be placed in front of each guest.